Before we get down to this fortnight's challenge I am delighted to introduce the new members of the DT to you. My name Is Ina. I live in Sunny Queensland Australia. I am married and have 2 grown daughters and 4 grandchildren. For a lot of my married life I was involved with breeding and showing Quarter Horses. I have been crafting for a several years now and and have made many new friends in Blog Land. I am retired and love to spend time in my 'play station'. 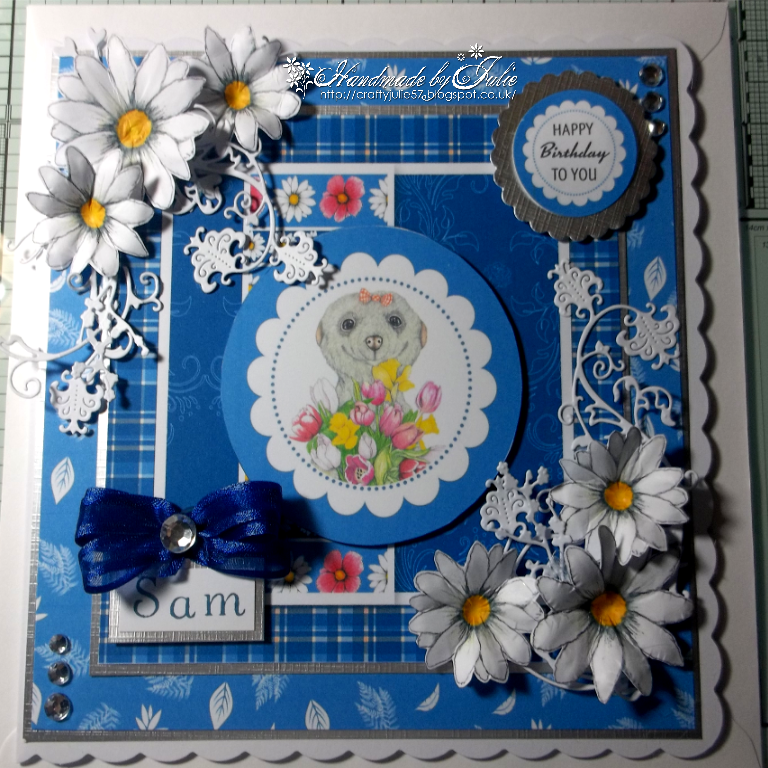 I also love scrapbooking and gardening. I enjoy the challenges our craft gives us and trying out new techniques. 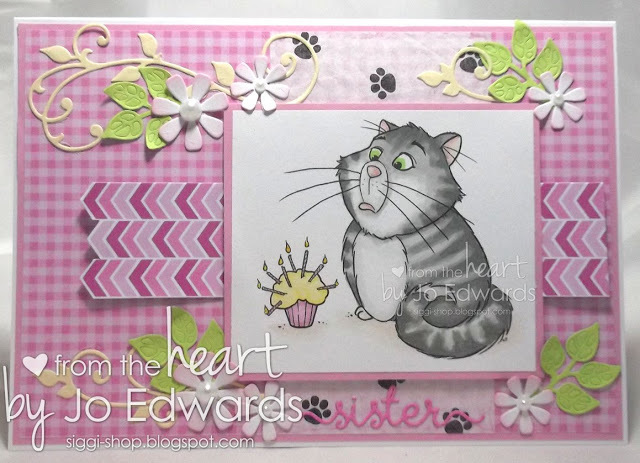 I'm not talented in the colouring field so you won't see too much of that from me but love stamping using my embossing folders and dies and don't mind getting inky fingers. 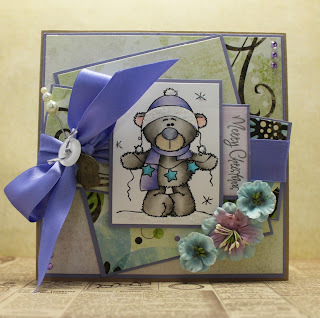 I am excited to be chosen as a Designer for Crafty Cardmakers as each challenge is something different, and I'm looking forward to new challenges, meeting new friends and some scrapbooking along the way. Hi there! 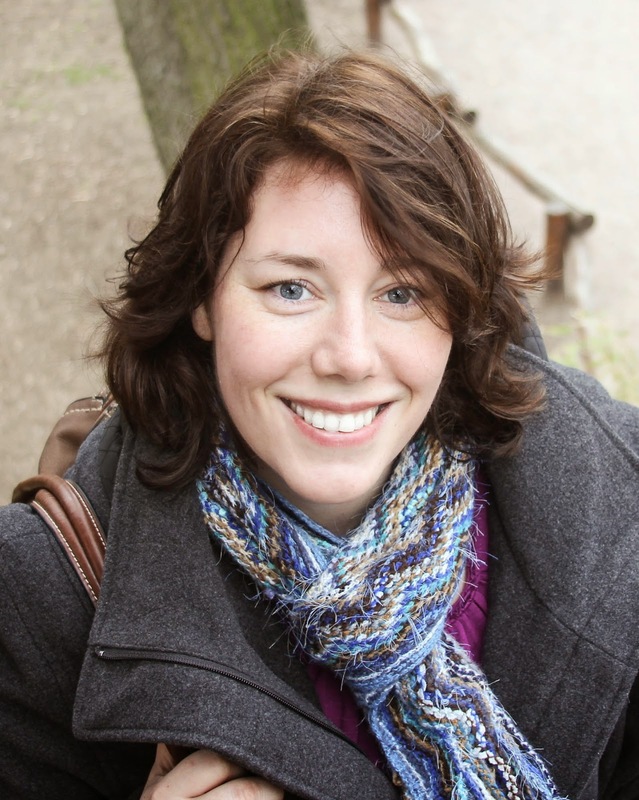 My name is Jenn and I am a lover of all forms of Art! I reside in Oregon with my fiancée and my daughter and grandson. 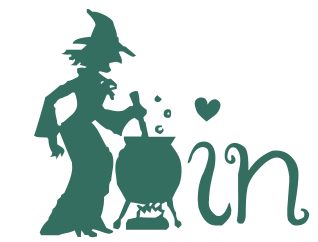 I have loved creating things for most of my life and while studying Business took most of my elective courses at college in Art! 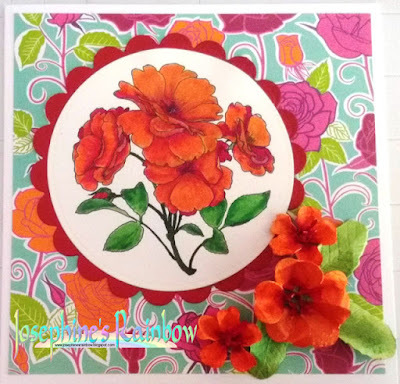 I not only love paper crafts such as card making and scrapbooking, but also enjoy altering thrift store and garage sale finds, jewelry making, doodle art and my newest found passion is mixed media! 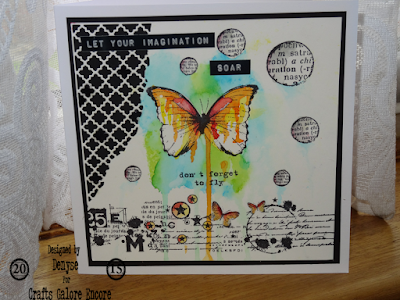 I love all of the layers and products available to create beautiful things even from junk! I am honored and excited to be a part of a Design Team that has become an inspirational place for me in my creations! Hello,my name is Nessa and I just love to craft!My style is mostly clean and simple,but I do like to get messy too!I use lots of different techniques in my cardmaking and crafty creations including stamping,inking,paper piecing,watercolouring and die cutting. 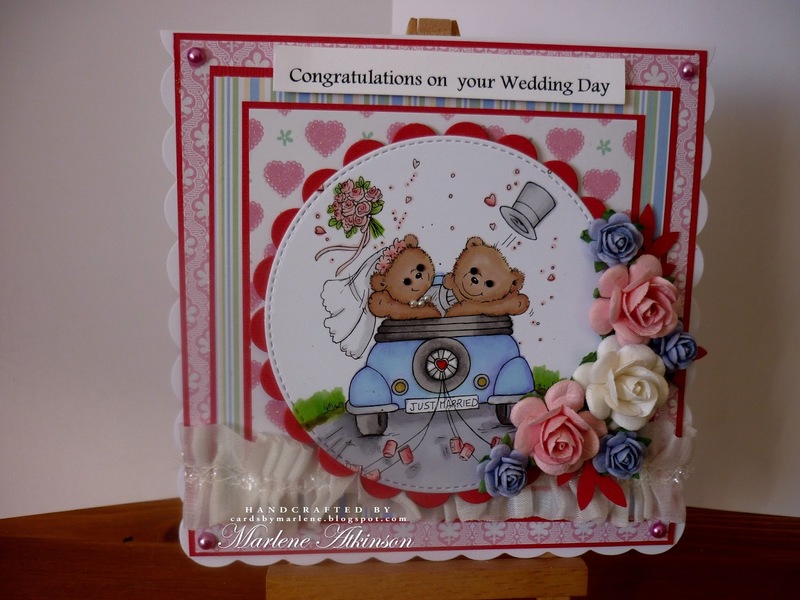 I was thrilled to be chosen as a Design Team member for Crafty Cardmakers And More,it is a lovely challenge and I like that it welcomes crafters of all abilities to join in and have fun! I have had the opportunity to enjoy many roles in my life; Wife, Mother and Grammy. I work PT at a great company and also love to golf, hike and spend time with family. 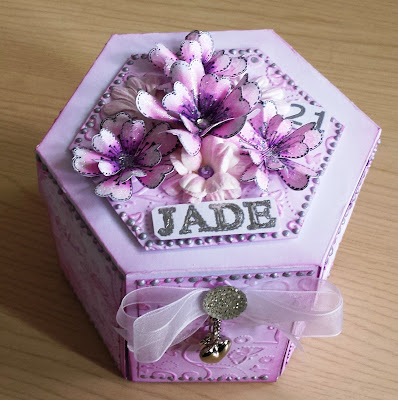 Crafting has always been a part of my life. From sock puppets, knitting and weaving pot holders as a child to One Stroke Painting, Crochet, Scherenschnitte, Tole Painting, Mixed Media and more as an adult. 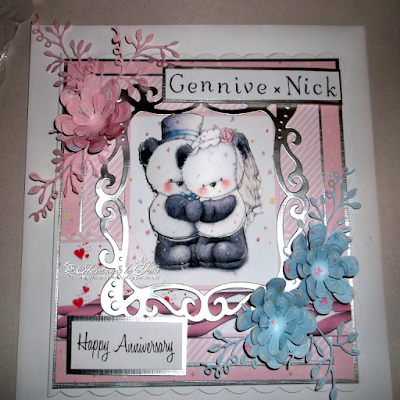 I have been making cards for the past four years. 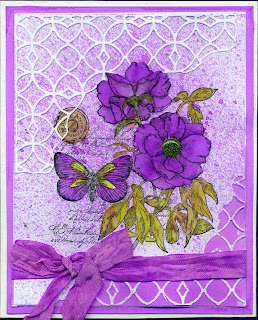 I started with Crayola colored pencils and a few digital images to see if I would like it. Well, yes I did! I mostly use Copics now, but I am looking forward to trying my hand at watercolor. The possibilities are endless! 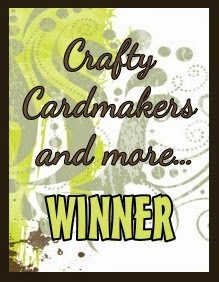 I am very excited and grateful to be a part of the Crafty Cardmakers and more DT. I am sure you will enjoy the new members of the team's projects and it would be great if you could pop by their blogs and show them some love. So down to the challenge for the next two weeks. Sally is hosting today and wants to see you 'Make It Sparkle' so any form of sparkle is allowed, glitter, gems, pearls, shimmer sprays etc. For my card I decided to start making my Christmas cards for this year. 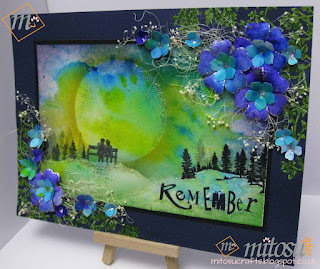 The image I have used is a digi from The Paper Shelter and has been coloured with Spectrum Noir Pencils and lots of texture paste and glitter to make the snow. For this challenge, I've used an image from Floppy Latte who sells via Stitchy Bear. The 'sparkle' comes from having coloured using my long-neglected Twinkling H2Os. I used the same paints to colour the various parts of the flowers and leaves so I'd be sure of colour match! For my first challenge as a new Designer here I decided to get out an old Cuttlebug die and glitter paper -perfect for getting another Christmas card made and in my favourite Christmas colours. 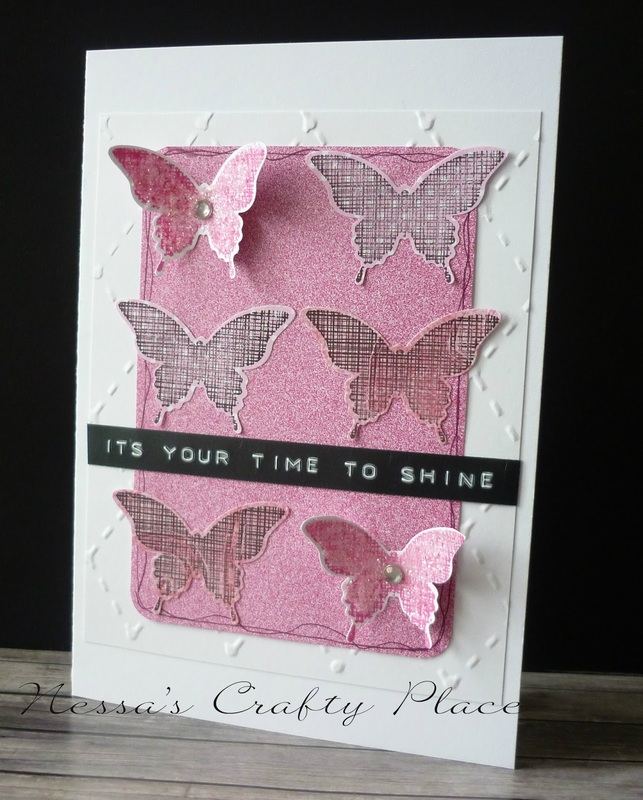 This is my first challenge on the Design team-I used up lots of scraps of pink patterned paper to make my Butterflies and added some sparkle with ultra fine glitter and some sparkly gems. What a fun challenge! Sparkle just makes life better, doesn't it? 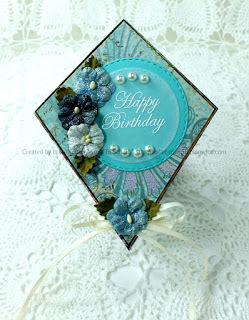 I have used an adorable LOTV stamp, Dainty Dancing. For "sparkle" Stickles were added to her tutu and the embossed flowers. Also, a brush of Wink of Stella for the stars. I am very excited to be a new DT member and look forward to seeing your beautiful creations for this and future challenges. I'm definitely not a glitter girl, but you have to have a bit of sparkle at Christmas don't you? 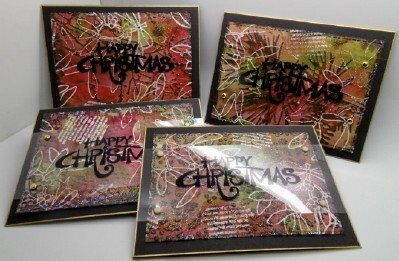 I made a set of Christmas cards with an embossed and glittered background forgetting how hard it is to photograph the acetate greeting panel across the centre of them. 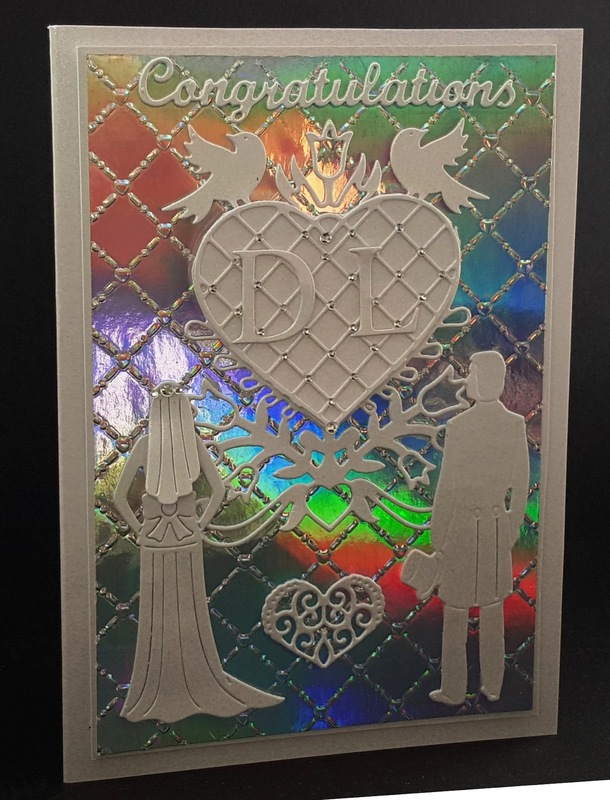 They really do sparkle honest lol. 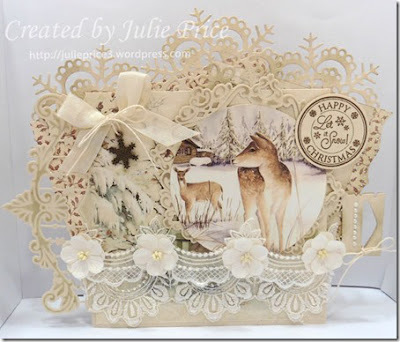 I have used some gorgeous gold cord (much sparkly in real life) and some rhinestones to add some sparkle to a Christmas card using Kaisercraft Yuletide range. 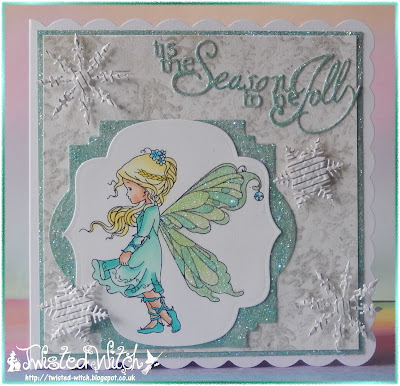 My sparkle card is my first Christmas Card for 2015, and has an image from Wee Stamps called Silver Fairy and Trimcraft's First Edition Silent Night papers. 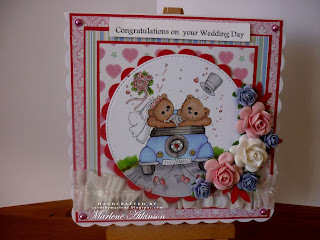 Please see my blog for more details. 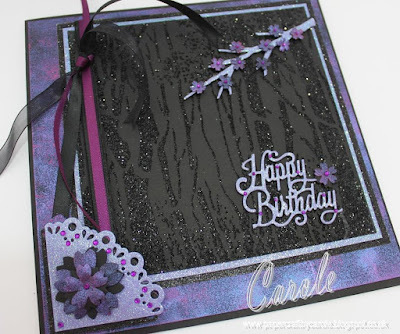 For my card, I have used clear texture paste through a stencil, covered with black glitter. I have also used glitter card, and a background created using Pebeo Dyna Paints. My card is one of the designs I've been playing with for this years Christmas cards - while I make special cards that I will give out, I like to make some that are simpler and less bulky to go through the post, and this is one of the results - the swirl is from a set I bought many years ago and this has been used to create a bauble with a die cut panel under which I have rubbed some distress inks. 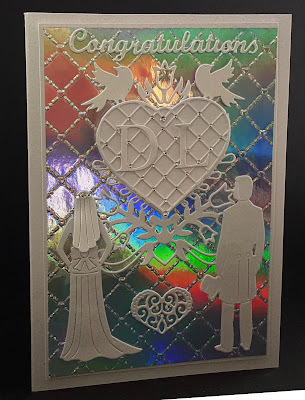 The stamp and greeting have been embossed with silver embossing powder, and accented with crystals (neither of which are playing ball when I took the photo!). 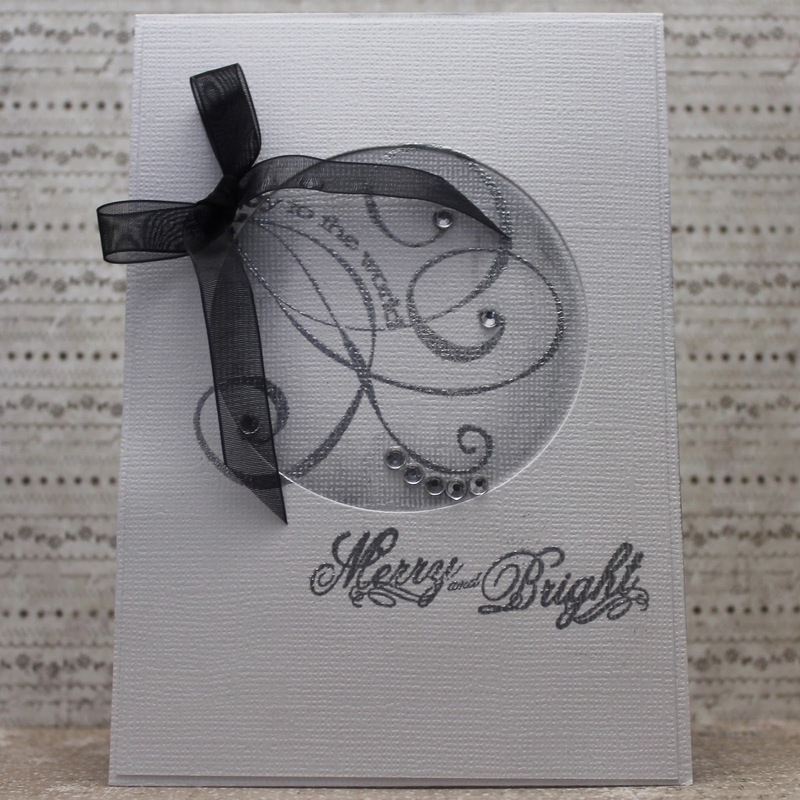 A simple black organza bow finishes the card off. 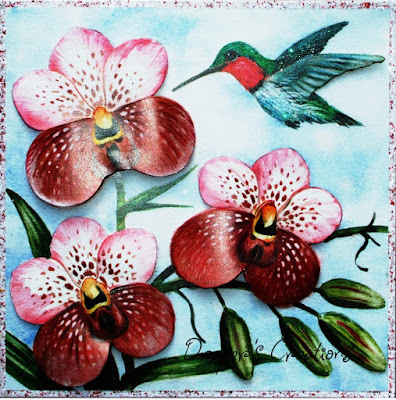 I used a decoupage sheet from La Pashe's Nice and Easel set and added Stickles and loose glitter to the edges and loose glitter to the bird's plumage. The sparkle is the gems. Before we get down to today’s challenge. Thank you all for your entries for our Design Team Call. I will be contacting those of you who were successful later in the week. 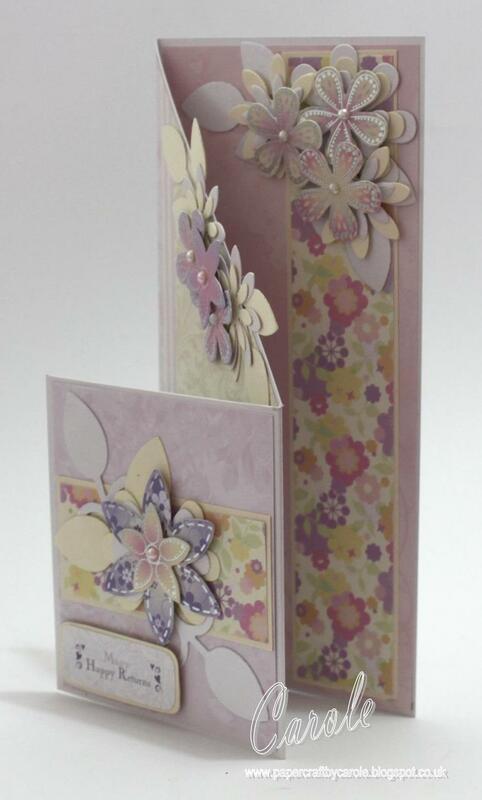 Julie is hosting our challenge today and would love to see your creations with additional floral embellishments. 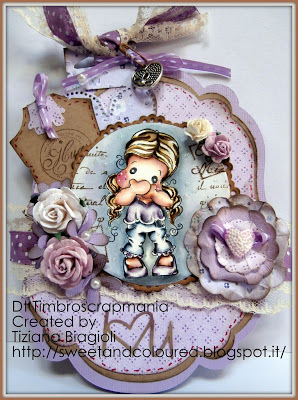 She wants to see your handmade creations and diecut, and premade flowers. 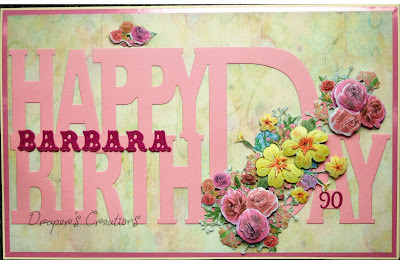 Please note, that although we are happy to see floral images these alone do not count for the challenge, you have to add dimensional flowers to qualify. I'm trying out a newish (to me) technique here, colouring on black card using a mixture of coloured pencils. For my card I used the Craftwork Cards 'Paradise' paper collection, some flower dies from Pinflair and a chipboard butterfly. 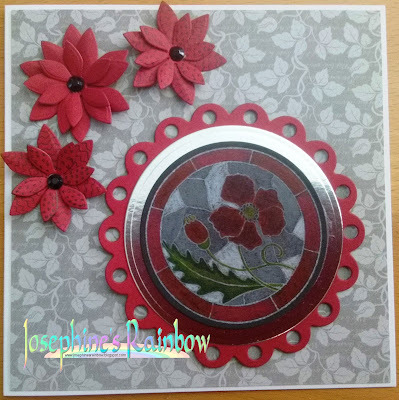 I have used one of the fabulous new flower stamp sets from Woodware for my card, along with some Dreamweaver dies and a Doobadoo Bubbles stencil. 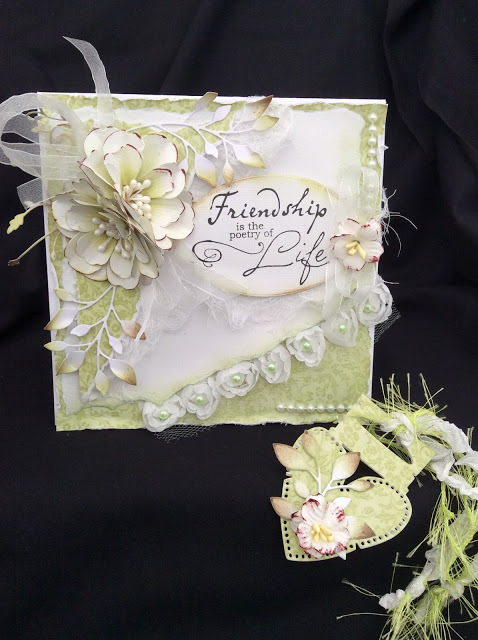 I have made a tri-fold card from Fresh White Centura Pearl, and lots of paper flowers I had in my stash along with some more I die-cut. My project this time is a gift box - complete with stamped decorative flowers coloured with chameleon pens and added wink of stella glimmer. My card this time is my first Christmas card of the year, and features one of my all time favourite images (sadly no longer available...) and some old Bo Bunny papers, and some Prima flowers. I'm determined to use my huge stash this year, as I have more stuff than you can shake a stick at! One down... another 30 or so to go! I just love the scene that Jay has created here. Stunning! This was just gorgeous. 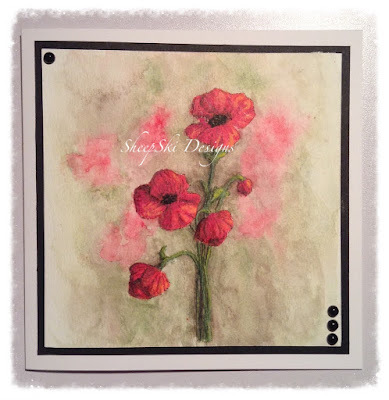 The Poppies looked like they were appliqued, as Andrea had created such dimension it looked more like a piece of fabric art than a coloured image! 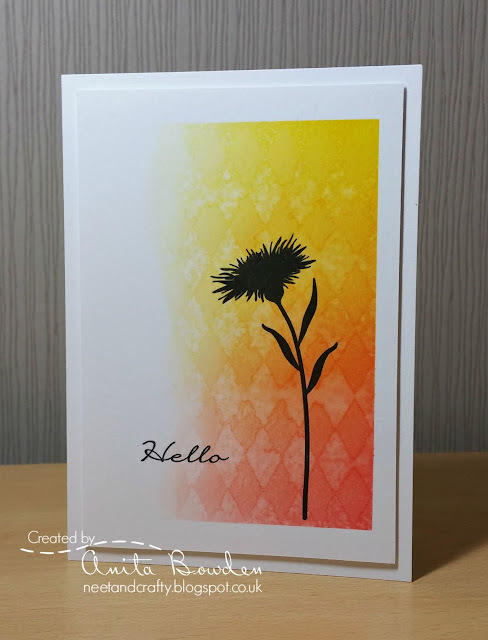 I love the blending of the colours and the subtle way they slowly fade away to nothing on the left hand side, and that gorgeous wildflower really pops against the beautiful background. 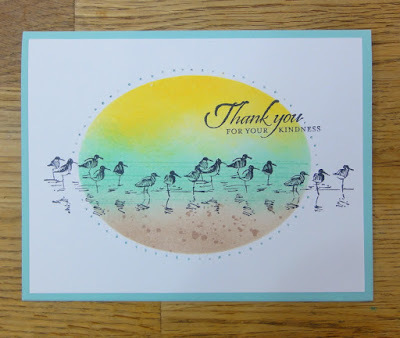 I love the scene Alicia has created in the central oval with subtle shading of inks, and the way the wading birds are just walking right through from one side of the scene and out the other side. There was so much going on here. 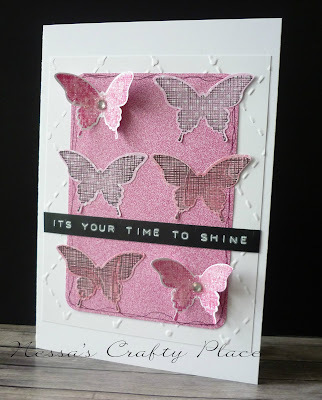 All the lovely stamping, the gorgeous blend of brushos, the butterfly with the drips running down and that fabulous die cut corner. 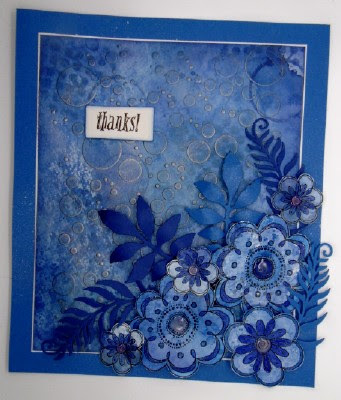 I love the soft splatter effect on the ink background, so subtle. 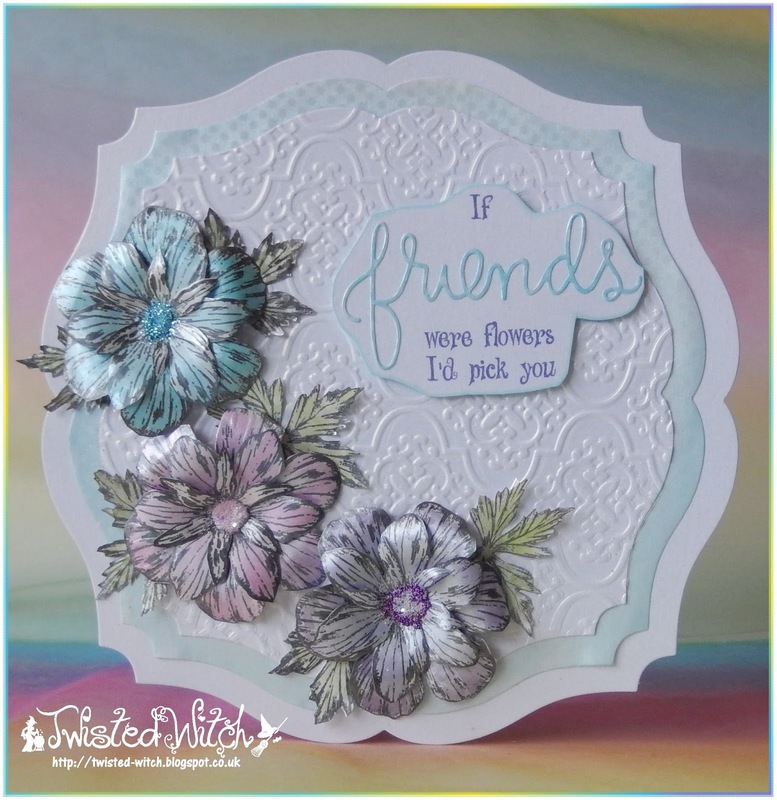 The flower image is just gorgeous and so vibrant and those diecuts are so delicate. Thank you all for such visual treats. 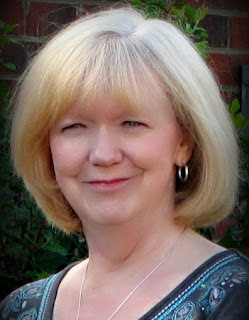 I thoroughly enjoyed visiting every one of your blogs.